Contrada fountains provide a successful means of incorporating traditional Contrada membership into modern life. Today, Senese families are more mobile and many live outside of the traditional contrada boundaries or bring home husbands or wives from other places. The traditional nuclear relationship based upon the community fountain as daily water source is long gone. In the 20th century, and the 21st, the enduring connection of individual Senese to their historical water system is symbolized by their baptismal initiation on their contrada’s annual Saint’s Day. This festival occasion brings families and neighbors together to celebrate their relationships to one another and to their community. 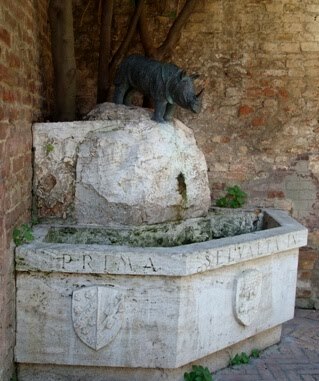 The first Siena contrada to commission its own unique fountain was Tartuca (tortoise). Sculptor Vico Consorti was engaged by the contrada to make a bronze turtle, but the original sculpture lacked animation and did not satisfy the contrada committee. 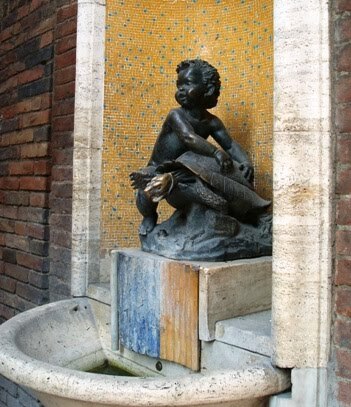 The replacement, as recast by artist Bruno Buracchini, depicts a child astride a tortoise in motion. Tartuca’s fountain was inaugurated in 1951, but due to the recasting and delays it was not the first but the second put into use. Tartuca’s patron, St. Anthony of Padua, is celebrated on June 13. The Tartuca contrada is in the southeast part of Siena, between the Pinacoteca and Porta Tufi, in Terzo di Città. 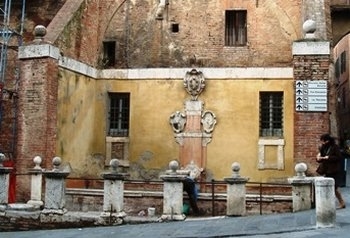 Their fountain occupies a niche in a wall on Via San Pietro. 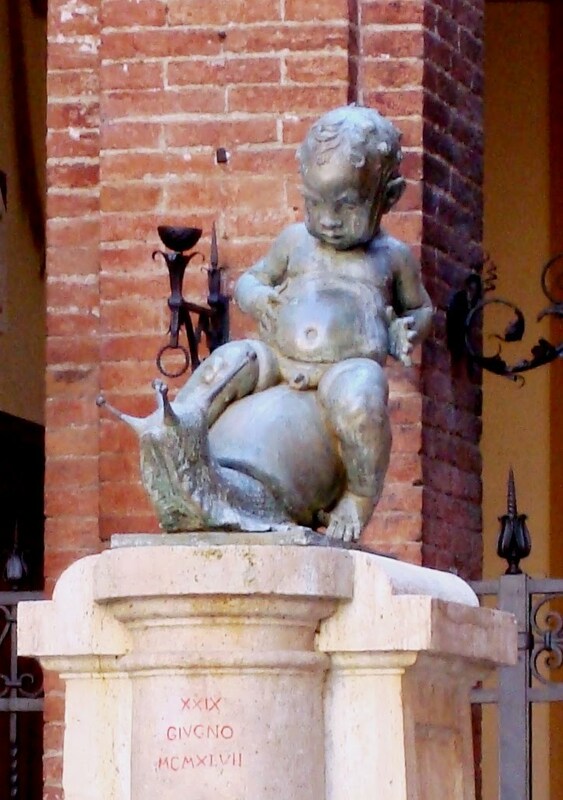 The foundry used by Tartuca to cast their fountain was located within the contrada of Chiocciola, the snail. Learning of their traditional rival’s plan, the Chiocciolini usurped the honor of inaugurating the first contrada fountain by installing a bronze of their own in 1947. 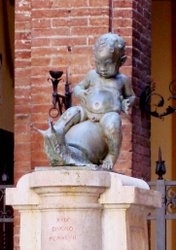 The sculpture, made in 1937 by Fulvio Corsini, is similar – a child riding a rollicking snail. Chiocciola’s patron, the Apostles Peter and Paul, are commemorated on June 29. The contrada is located at the southeast corner of Siena, in Terzo di Città, and their fountain graces a small piazza on Via San Marco. The third fountain was installed in 1954 by Torre (tower) but was replaced in the 1980’s by Mauro Berrettini’s bronze of a prancing elephant, its trunk upraised and bearing the tower. The piazza in which the fountain is displayed was in turn redesigned during the early 2000’s. Torre celebrates the festival of the Apostle James on July 25 and is located in Terzo di San Martino just south of the Campo. This area includes Siena’s historic Jewish ghetto and the city’s original marketplace. 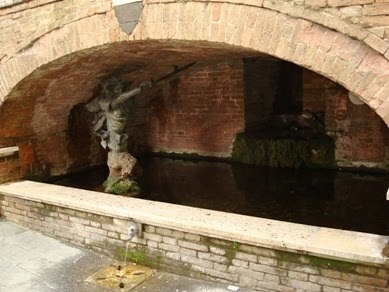 Torre’s fountain is found in Via Salicotto. 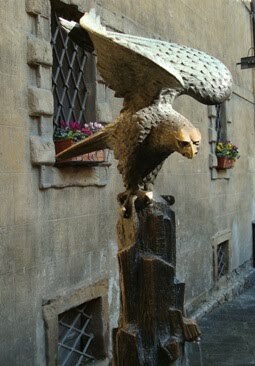 Civetta (owl) contrada’s original fountain, installed in 1960, was replaced during the renovation of the contrada’s piazzetta in 2005. Their fountain, the work of Fabio Belleschi, represents the owl in its natural size, in flight and supported by a simple structure that does not interfere with its intimate setting. In 1962 Istrice (porcupine) inaugurated their fountain. The design is that of the crowned porcupine, a stone bas-relief, sculpted by Vico Consorti. The contrada’s territory is located in Terza di Camollia and extends from the gate at the extreme north part of the city south to Piazza Gramsci and the Fortezza. The fountain is located in Piazzetta della Magione off of Via Malta. Istrice’s feast day, August 24, celebrates the Apostle Bartholomew. In the same year, 1962, Lupa (wolf) introduced a fountain that was a collaboration between 2 artists: Emilio Mantagnini sculpted the bronze wolf, and Giovanni Barzacchi created its travertine stone pedestal and basins. Lupa’s patron, Saint Rocco, is celebrated on August 16. The contrada is located in Terzo di Camollia just east and south of Istrice. Lupa’s contrada fountain is located near Fontenova, in Via di Vallerozzi. The fountain of Aquila (eagle) contrada features Bruno Buraccini’s bronze sculpture of an eagle with wings partially extended and was inaugurated in 1965. It is located in a corner known as Quattro Cantoni where Via di Citta becomes Via di Stalloreggi, about 200 meters south of the Campo in Terzo di Città. Aquila’s saint day is the feast of the Nativity of Mary, celebrated on September 8. Aquila’s neighbor Selva (forest) contrada inaugurated their fountain in the same year. It features a rhinoceros standing among the trunks of living trees and is the work of sculptor Vinicio Guastatori. The fountain is located in Piazetta della Selva, which is just north of Santa Maria della Scala in Terzo di Città. Selva celebrates their feast day on the Assumption, August 15. We were thrilled to receive special permission to visit Selva’s museum in September 2007. To see Nick’s photos of their private treasures and Palios, visit the page on their Contrada Museum. The fountain of Giraffa contrada is a collaboration between architect Salvatore Bocci and sculptor Pier Luigi Olla, and was first used to baptize new contradioli in 1970. The image in brass bas-relief is that of a giraffe wearing a bridle and straining against the reins. The fountain is located in Piazzetta della Giraffa just off of Via del Fosso. 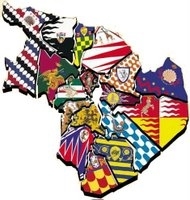 The contrada encompasses the Basilica of San Francesco, their contrada church of Santa Maria di Provenzano, and a large green area, on the east side of Siena. Giraffa’s feast day is the visitation of Mary, on July 2, which is also the date of the Palio of Provenzano. 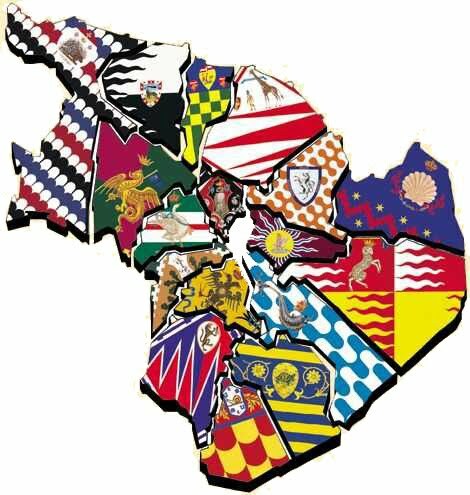 The contrada winning the July Palio always comes directly from the Campo to the church of Santa Maria di Provenzano to sing the Te Deum. The fountain of the Onda (wave), inaugurated in 1972, is another collaboration, this time between sculptor (Alfonso Buoninsegni) and architect (Algero Rosi and Vittorio Conti). 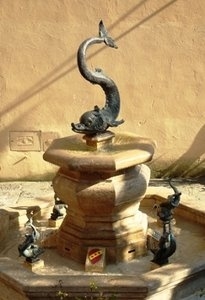 The brass dolphin fountain is located just down the hill from the church of Saint Agostino, on Via di Fontanella. Onda contains a large area of privately-owned open green space where, unfortunately, the old Fonte di Fontanella is no longer accessible to the public. Onda’s feast day is also July 2, the visitation of Mary and date of the Palio of Provenzano. Drago contrada’s fountain, inaugurated in 1977 and created by sculptor Vico Consorti, is somewhat unusual in that the totemic dragon is not featured. 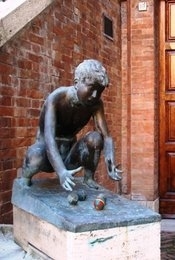 Rather, it depicts a boy playing a game of “pallone,” racing a collection of balls. In the statue, the only ball actually bearing colors is the winning one, carrying Drago’s red and green. Drago is located in Terzo di Camollia and extends from the stadium to San Domenico and east to Via dei Montanini. The fountain is tucked into a corner of Piazza Matteottti. Drago’s patron saint is Catherine of Siena, whose festival falls on April 29. Pantera’s fountain was inaugurated in the same year as Drago’s, and is the work of sculptor Giulio Corsini. 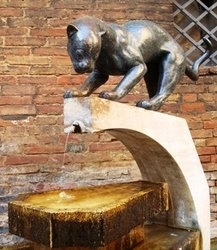 The sleek bronze panther crouches, gazing attentively into the basin below. 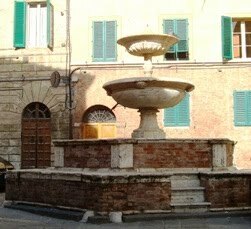 The Pantera contrada is on the southwest side of Siena and their fountain is located in Piazza del Conte, on Via di San Quiricio. Their patron, Saint John the Beheaded, is celebrated on August 29. 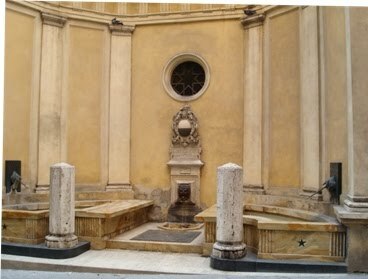 In 1978, the Bruco (caterpillar) contrada adapted an existing fountain to serve for their baptismal. 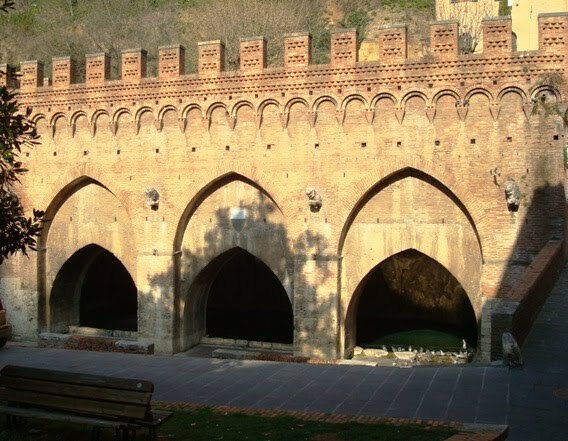 Architect Lorenzo Borgogni restored the Fonte dei Frati Minori (also known as the Fonte di San Francesco) and added two sculptures. One, of a caterpillar, is found at the water inflow, and the other, of Barbicone the legendary leader of the Bruca, is the work of sculptor Angelo Canevari. Bruco’s territory extends from Porta Ovile to Piazza San Francesco along the north wall, and south to Palazzo Salimbeni. The fountain is found along Via delle Rozzi just south of the church of San Francesco. Bruco’s feast day is also July 2, the visitation of Mary and date of the Palio of Provenzano. Another contrada which adapted an existing fountain for their own use is Leocorno (unicorn). For their baptisms architect Carlo Nepi added twin unicorn heads to supply the water to the existing Fonte di Pantaneto in 1997. Leocorno’s triangular territory extends from the San Martino corner of the Campo east to Fonte di Follonica, and south to the church of St. Giorgio. The fountain occupies a niche along Via di Pantaneto just beyond the Piccolomini palace. Leocorno celebrates their feast day on June 24, in honor of Saint John the Baptist. The Oca (goose) contrada has adopted as their baptismal fountain the pre-Etruscan landmark within their territory, Fontebranda. No changes were made to the monumental fountain, which is found in Via Fontebranda. Oca has the largest population residing within its territory, which extends from Porta Fontebranda east to Via delle Terme. Their patron saint, Catherine of Siena, once resided within their territory, and they celebrate her feast on April 29. The Valdimontone, or Montone (mountain lion) contrada also uses a historic monumental fountain for their baptisms. Its traditional name is Fonte di Ponte di Romana and it is located in Via San Girolamo. It is decorated with several sculptures including the Medici coat of arms, but none specific to its contrada affiliation. Valdimontone’s territory is extensive, extending south and east to the city wall from Siena’s old market, but much of this area is green space. Valdimontone has the earliest saint’s day each year, April,26, in honor of the Madonna of the Good Counsel.